The Total Slicer, Dicer, Grater, Shredder, Chopper and much, much, more! 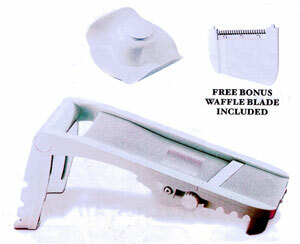 Enjoy A Lifetime of "Super" Service From the Super Slicer! This is the same amazing Super Slicer you’ve seen advertised on TV .The same revolutionary Super Slicer that makes every meal look as if it were professionally catered by a gourmet chef! With this lightweight, portable Super Slicer, there’s no complicated directions or confusing attachments - just ultimate simplicity, versatility and durability! The Super Slicer features the finest surgical steel blades and 6 thickness levels from super thick to julienne, so slicing, dicing, shredding, chopping and garnishing has never been simpler! With the Super Slicer, you can make even the simplest dishes look more exciting and appetizing by adding everything from a spiraled potato to a scalloped tomato. Best of all, clean up is a snap...just put the Super Slicer in the dishwasher and you’re done! We guarantee that you’ll be amazed at how easy it is to prepare food, get fresh squeezed juice, garnish a meal and so much more. I have used this mandoline and so far, I love it. It is so fun and easy to use that I find myself looking for reasons to add additional vegetables to dishes that I am preparing. Yesterday I made a 7-layer salad and it took all of 5 minutes to slice the veggies.